How does God deliver His gifts? It’s an interesting question. Does that thought even register in our minds? Do we consider that at all? We all agree that the Lord pours forth His gifts. We’ve all received gifts from the Lord. Each and every day and each and every Sunday we receive gifts from the Lord. He even gives gifts to the unrighteous, to the wicked, to the unbeliever! The Lord is like fountain of blessings. We know this. But how? How does the Lord do this? What sort of economy does He use? We have debts and inflation. We have credit card statements, bank statements. There are bonds and treasuries all making it so all the wheels and cogs of everyday life keep turning and going. And those wheels and cogs of industry, employment, dinner on the table are all greased by one thing: money. What of the Lord’s economy? How does He dole out His gifts? Well, He doles them out abundantly. How else would the Lord give them out? “And those who ate were about five thousand men in number, besides woman and children.” A bounty of people requires a bounty of leftovers: “And there was an abundance of fragments—twelve large baskets full.” There was no moment when Jesus pulled out a scale and said, “Three ounces of bread and 1 1/4 ounces of fish for you. Now, move along.” He keeps on giving, so all thought of calculating out your portion is left behind and you have Him going on giving, more and more left over. But with Him there are gifts abundant, gifts innumerable, even for the unrighteous: “He makes His sun rise on the evil and on the good, and sends rain on the just and on the unjust.” So St. John the Evangelist records Jesus’ words from after the feeding of the 5,000: “You seek Me, not because you saw the signs, but because you ate of the loaves and were filled.” Even the unrighteous, unbelievers, wicked people, pagans, heathens reap blessings from the death of Jesus, even if they don’t realize it and even if they are only temporal ones. But look at these gifts flow—bursting forth like a flood. Food for thousands: “those who ate were about five thousand men in number.” Food for probably 5,000 more: “woman and children.” Food for all people. Food for you and me. Even though we doubt and don’t believe we’re going to get it, but it comes any way because of Jesus. Finally, see HOW they’re given out! Jesus “taking the five loaves and the two fish, he looked up to heaven and said a blessing.” No fish unless the Father had spoken His Word on day 5. No bread without day 3. Jesus looks to the Father. “Every good gift comes down from the Father of lights.” They come because of Jesus and through Him. No fish sandwiches without Jesus, and no food on your plate either without Him, the Lord. No food unless He had first created it. No farmer. No food. No stock boy. No food. No chef. No food. No elbow grease on your part or maybe in your garden, if you have one—“If anyone will not work, neither shall he eat,” says Paul. “In the sweat of your face you shall eat bread.” So also with Jesus. No food without His bloody sweat. Jesus had said to His disciples, “You give them something to eat,” and so then they do: “Then he divided the loaves and gave them to the disciples, and the disciples gave them to the crowds.” The Lord hands out His gifts in this life through means. As the gumbo, so the Spirit, so the Word, the Water, the Body and Blood. Nothing comes to us apart from the means. If it’s not that way with the gifts we receive each and every day, do we think it will be that way with the gifts we receive each and every Sunday? 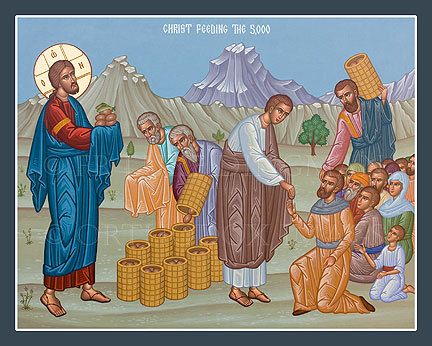 “Then he divided the loaves and gave them to the disciples, and the disciples gave them to the crowds,” and as we’re told in Acts 6: “The twelve summoned the full number of the disciples and said, ‘It is not right that we should give up preaching the word of God to serve tables.’” The gifts are given because of and through Jesus, but they are also given through means. The twelve disciples handed out the bread in our text, but they also were called by Jesus, sent by Jesus, apostled by Jesus to give out not just bread but Jesus Himself, the Bread of Life. But there’s even more from the Lord: means through means. Spirit found in us only by Water and by Word: “through the washing of rebirth and renewal by the Holy Spirit” and “faith comes from hearing, and hearing through the word of Christ.” So we hear in our text “5,000 men, besides woman and children,” but each was satisfied: “all ate and were satisfied.” Bread for all, bread and satisfaction for each. So also the Lord’s eternal gifts “baptizing all nations” but also “whoever is baptized will be saved.” The pastors are called to “preach repentance and forgiveness of sins to all” but to each they say, “I forgive you all your sins” because Christ says, “If you forgive the sins of anyONE.” So the Lord divides His bread, “He divided it and gave to the disciples,” “saying, ‘Take; eat. This is My body which is given for you.’” So also the blood. Disciples apostled by the Lord to do all this. Pastors pastored by the Lord through the Apostles, and through pastors, in His Church to do all this. Jesus is the source of the gifts, the reason for the gifts—temporal and eternal. He gives them out in His way. Only in His way. GOD ONLY AND ALWAYS USES MEANS TO DELIVER HIS ALWAYS WITHOUT-LIMIT AND BOUNTIFUL GIFTS. Yes, the gifts are given this way by the Lord: bread and fish upon bread and fish (“twelve large baskets full.”); forgiveness upon forgiveness upon forgiveness upon forgiveness (font full, pulpit full, chalice and paten full, pastor full)—the Lord Jesus always giving more and more and more. He won’t stop. Their source: His cross. Don’t you want more? Jesus has it.